Right-click a contact in the Contact List and select the "New Text Message to Contact" command. Right-click a distribution list in the Contacts tab and select the "New Text Message to Distribution List" command. Open a contact in the Contact Editor and click the "New Text Message" button at the top of the window. Click the phone button on the right side of the contact's mobile phone number field in the Contact Editor. VueMinder can send text messages to the contacts or distribution lists, provided the selected recipients' cell phone has been specified. Also, if the SMS/Voice option to use your own mobile carrier instead of a web-based carrier for SMS messaging, you'll also need to have specified the contacts' mobile carrier information. 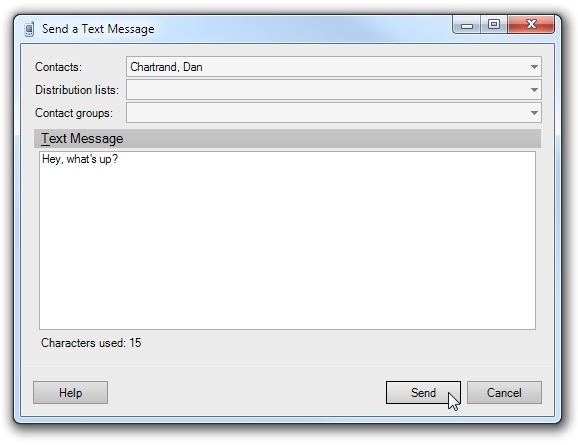 The Send a Text Message window enables you to type a text message. You can also add additional recipients to the message. The message will be sent as soon as it has been typed, and can contain anything you'd normally send in a text message from your cell phone. The benefit to using this command is that it supports sending the same text message to multiple recipients at the same time. Some phones don't support distribution lists for text messages, so this is a convenient workaround for users lacking this feature on their phone, or anyone that prefers typing with all 10 fingers instead of 2 thumbs. Note that VueSoft does not charge anything to send text message reminders. However, depending on your mobile carrier and the mobile carriers of your recipients, additional fees from the mobile carriers may apply. VueSoft is in no way responsible for any of these charges. This disclaimer is part of the license agreement that must be accepted before VueMinder can be installed. You can choose one or more contacts, distribution lists, or contact groups to receive your SMS message. You can specify individual contacts to receive the text message. When clicking this field, a drop-down list of contacts will be shown. Use the checkboxes to select the desired contacts. Only contacts where a cell phone number and mobile carrier have been specified will be listed. If you need to add or edit a contact, click the "..." button to access the Contact Editor. The text message can be sent to one or more distribution lists. To select the desired distribution list(s), click the drop-down button and use the checkboxes. All contacts belonging to the selected distribution lists, and having the required mobile phone number and mobile carrier information, will receive the text message. The Contact Editor contains a "Group/category" field. If this field is used, you'll see a drop-down list of the currently used contact groups. Use the checkboxes to select the desire contact groups. This can be used as an alternative to distribution lists. Any contacts associated with the selected group(s) will receive the text message, provided their mobile phone number and mobile carrier have been specified. After selecting the recipients and entering your message, click the Send button to send it. Note, when using your own SMS carrier in the SMS/Voice options, your email settings also need to be specified, since the message is emailed to your carrier's email-to-SMS gateway and then converted into an SMS message for delivery to each recipient's cell phone. When using the web-based SMS service, the message is transmitted directly as SMS and email settings are not needed.